The Konica Minolta Group (Konica Minolta) has decided to support the Women's Health Forum, which is a course on women's health offered in Beijing, China with the purpose of "communicating about health to the women we love." An outline of the Forum has been announced in Beijing. The first course started in October 2008. Courses will be held five times through March 2009. About 400 people are expected to take the course each time. 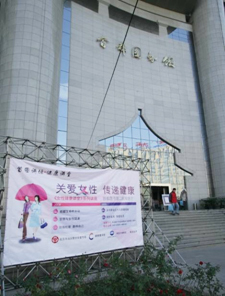 The Women's Health Forum is being jointly sponsored by the Beijing Women's Federation, the Beijing Capital Library, and Konica Minolta. It is a two-hour long serial course on the topic of women's health held once a month. The purpose of the Forum is to first of all establish awareness among women about prevention by sharing knowledge regarding the prevention of disease and to have women think about their health, such as how to prevent and overcome breast cancer and other women's diseases by exploring these diseases and their causes. From October 2007 to March 2008, Konica Minolta sponsored the Women's Health Forum held in Shanghai. Over the six-month period the Forum addressed women's health subjects from different perspectives and was well received by many of the city's residents. Based on the results achieved in Shanghai, it was decided to move the venue to Beijing and provide information on the prevention of disease to as many women as possible, in the conviction that Chinese society needs more opportunities to think about health and needs to expand health awareness.